It often comes as a surprise to brides and grooms to-be just how expensive flowers can be. Yet, considering that a small bunch of flowers from your local supermarket can easily cost £10, it's hardly surprising that the floral ceremony arch, 10 table centrepieces, 4 bridesmaid bouquets and one for the bride can easily clock up a couple thousand pounds worth of flowers. Especially if you've got your heart set on peonies in November (or something equally out of season!). Not only are you paying for a incredibly large quantity of flowers, you're also paying a highly skilled florist for their time and expertise. From advising and designing in the early stages, to collecting the flowers and then constructing the arrangements before installing in the venue. For this reason, many couples (with some helpful mums and bridesmaids) opt to arrange their own flowers in a bid to save costs. If you're a total floristry novice, however, this in an incredibly large job to undertake, and should not be done without very careful consideration and planning. If you are considering arranging your own flowers, we highly recommend taking a short course in floristry some months prior to the wedding so that you can learn the basics. The Covent Garden Academy of Flowers recently invited us to try an evening course at their central London studio, where we learnt how to make a beautiful hand-tied bouquet. In a comfortable, relaxed envorinment with just a few other class members, we learnt everything from how and when to cut the stems of the flowers, to the tricky art of 'spiralling' (the technique used to secure each stem in the bouquet thus creating a nice balanced shape on top - harder than it looks!). After just one evening all class members felt decidedly more confident handling flowers, and we could hardly believe how professional our bouquets looked! 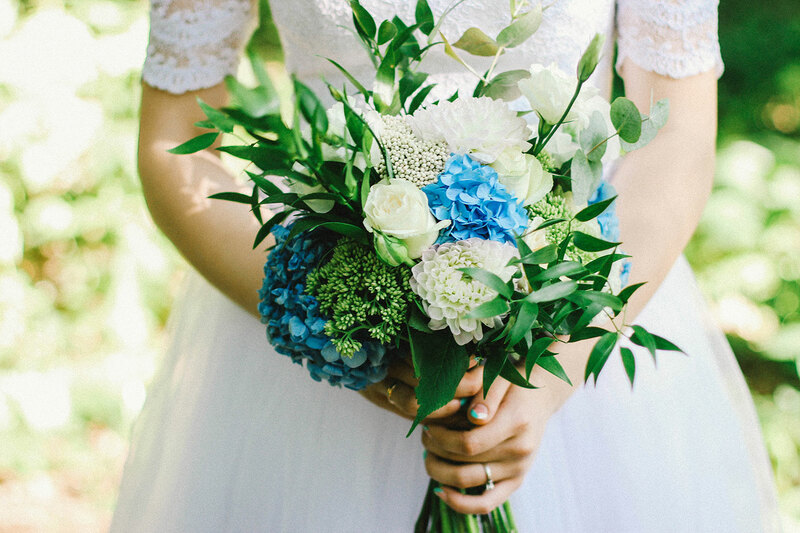 Covent Garden Academy of Flowers also offer courses aimed specifically at those wishing to do their own wedding bouquets, or a even a full day experience starting off with a trip a flower market to choose the flowers! You probably won't be able to recreate the floral centrepieces or flower arches you've seen on Pinterest and Instagram without the help of a florist and a hefty budget. Stick to simple ideas with just a few variations of bloom and lots of cheap fillers and foliage. Gypsophila is a great cheap bloom for adding volume! A florist would put the finishing touches to your flowers and install them on the morning of the wedding, but you'll be busy getting ready! Enlist some helpers to get the bulk of the work done the night before (and leave everything having a good drink of water!) and then have some trusted friends or parents install the flowers where you want them on the day. Doing a short evening or day course with a trained florist will give you confidence when it comes to going it alone. You'll be able to ask advice on the types of flowers to use, what will be in season when and how to cut and arrange them. It's also a nice activity to do pre-wedding with your bridesmaids or mums! We also offer fun hen party workshops where you can create pretty floral crowns or posies! And here is the bouquet we created - looks pretty professional huh?! You can check out Covent Garden Academy's profile here and see courses on their website here.